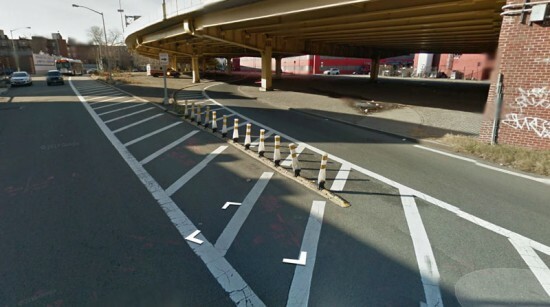 Since the Brooklyn-Queens Expressway (BQE) was constructed nearly 70 years ago, the inelegant thruway has callously split apart neighborhoods, leaving beneath it deserted stretches, visually unappealing and often vulnerable to crime. DNA Info reported that Myrtle Avenue Brooklyn Partnership is trying to revive one such blighted area in the Wallabout district of Clinton Hill. The strip right at Steuben Street and Park Avenue, which has been a site for dumping illegal trash, could soon host a farmer’s market, public art, dog run, and live music. The partnership is proposing a range of uses and looking to collaborate with local businesses—such as the creators of the now defunct DeKalb Market—to help bring activities and services to the area. The effort to revamp the inhospitable corridor beneath the BQE has been part of an ongoing endeavor that has involved a number of organizations, spearheaded by the Myrtle Avenue Revitalization Project (MARP). MARP launched a planning initiative in 2009 utilizing experimental art collective, raumlaborberlin’s Spacebuster, and partnering with local institution Pratt Institute’s Planning Department to hold mini-visioning workshops. Later MARP partnered with Architecture for Humanity New York (AFHNY) to work on a 2-year planning effort called “Under the BQE” that helped to engage the community and re-imagine new uses for the spaces in addition to creating a plan to improve pedestrian and traffic safety. First the partnership needs some funding to jump start any changes to the space. They are currently hoping to receive a NYCDOT Public Plaza grant. A wining application will be selected by January 2014.